Traditions can appear very strange to outsiders and sometimes even offensive. 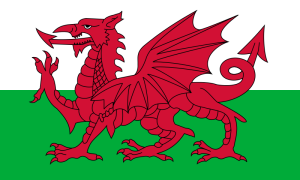 I’m from Wales, in the western part of the United Kingdom. Welsh people are very proud of their country, sometimes to the point of complete insanity! On March 1st every year we celebrate Saint David’s Day, a special day in Wales. Saint David is the patron saint of Wales and we have celebrations in schools. Usually on Saint David’s Day, different school “houses” compete against each other in various contests rather like the houses (Gryffindor, Slytherin etc.) in the Harry Potter series. Wales has two symbols: the daffodil and the leek. 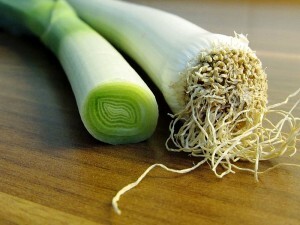 The leek has come to be regarded as symbolic of the difference between Wales and England in some strange way. Many children come to school with huge, smelly leeks attached to their clothes! This is an obvious problem. The leeks smell incredibly bad and some people, particularly people who have come to Wales from other countries, complain about it. From their perspective, it is simply stupid or crazy. Should people in Wales be allowed to behave in an anti-social way just because it is traditional? There are other British traditions that have an anti-social element. 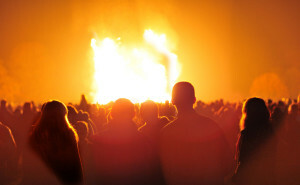 Take the British tradition of Bonfire Night, for example. Incredibly, it is an openly anti-Catholic tradition celebrated each year on November 5th. People today usually build big bonfires and light fireworks. Over the years, there have been many accidents associated with these rather dangerous practices. The anti-Catholic significance of November 5th can be traced back to the Gunpowder Plot of 1605. The conspirators in the Gunpowder Plot hoped to blow up the Houses of Parliament, kill King James I and replace him with a Catholic monarch. 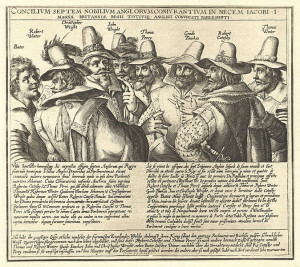 The most famous of the conspirators was Guy (Guido) Fawkes — third from the right in the picture above. The plot failed and the conspirators were all punished. Soon afterwards, Parliament passed a law requiring people to give thanks to God for stopping the Catholics. Church bells were to be rung and bonfires were to be lit. This law remained in place until 1859 but people continued to celebrate the event even after the law was repealed and it has remained an enjoyable and rather impressive tradition to this day. Even when the government wanted people to stop these anti-Catholic practices, they still kept up with the fires! Over time, the tradition changed from being a general anti-Catholic day to Guy Fawkes day. Effigies of Guy Fawkes were burned on the bonfires. Here comes the rather strange part. 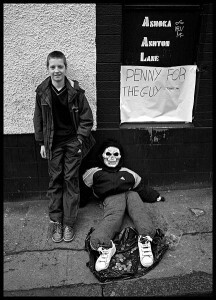 Children make effigies of Guy Fawkes, display them on the street, and collect money from people who pass by. Then the effigies are put on bonfires and burned. The question is, why have these rather odd bonfire-related customs remained so popular? And why do people burn these funny dolls? 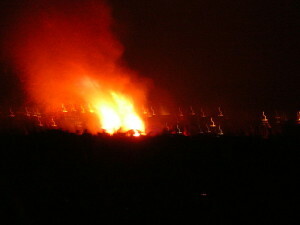 Some people claim that the British bonfire night celebrations are a kind of continuation of ancient Halloween-type festivals. 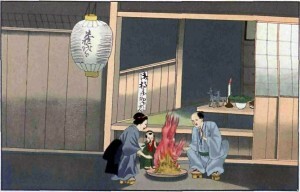 People welcomed the spirits of dead ancestors into their houses at the beginning of November by building bonfires. They would often make sacrifices to the spirits by burning animals — or even people — on these bonfires. 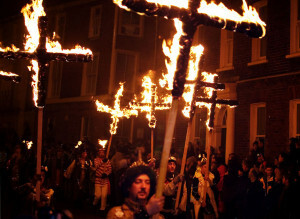 It became difficult for people to continue with these pagan customs as Britain became a Christian country. Even so, there seems to be a deep need to continue with these traditions and people find a way to carry them out in any case. Some people believe that, as Halloween becomes more popular again, Guy Fawkes Night will become less popular. It seems that the British Guy Fawkes Night celebrations are similar to the Japanese Obon custom deep down. Is there some deep desire that drives such customs even where people no longer understand them, as in the case of the Guy Fawkes Night celebrations? Photo. There may be deep desires, perhaps needs, driving traditional customs. And these desires may not be understood very clearly by the people who are carrying out the customs. This raises certain questions. Is it a problem, for example, that clearly anti-Catholic feelings are celebrated annually in Britain? Isn’t Halloween a nicer way to carry out what are essentially the same customs without the anti-Catholic sentiment? Bonfire celebrations in Lewes, in the south of England are positively hostile to Catholics and can even feature an effigy of the Pope burned on a bonfire! Is that kind of tradition really OK? Photo. Can you think of any examples of how some Japanese traditions may pose problems to other people? Anyway, check out the PowerPoint slides here. Frazer, J. G. (1922). The golden bough: A study in magic and religion. The Macmillan Press.